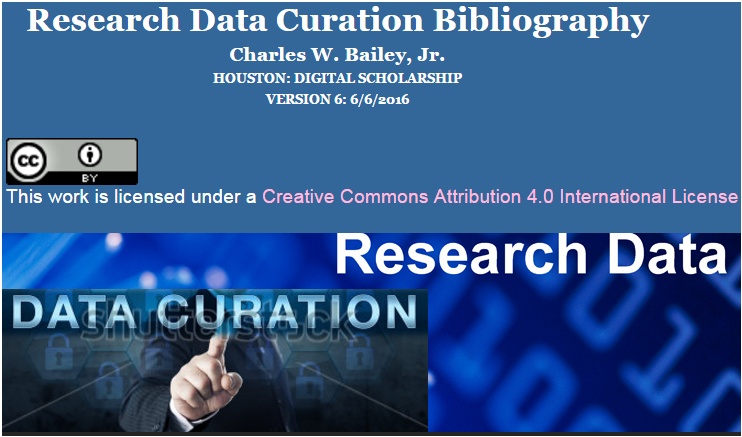 Digital Scholarship released (on June 6, 2016) Version 6.0 of the Research Data Curation Bibliography under a Creative Commons Attribution 4.0 International License. In a rapidly changing technological environment, the difficult task of ensuring long-term access to digital information is increasingly important. To tackle issues of long-term digital preservation and adequate knowledge representation of and access to information/data in a number of domains, the movement towards Digital Curation could be seen as a reaction to earlier approaches of information management which, while recognizing the urgency of developing solutions to deal with the rapid obsolescence of digital information and its volatility, failed to address the need to ensure adequate representation and long-term access to digital information as its context of use changes. providing for continuous enrichment (by adding value, extending beyond the preservation domain) and updating to keep digital information fit to purpose in relation with evolving designated communities. In particular, Digital Curation “involves maintaining, preserving and adding value to digital research data throughout its lifecycle. The active management of research data reduces threats to their long-term research value and mitigates the risk of digital obsolescence. Meanwhile, curated data in trusted digital repositories may be shared among the wider […] research community. 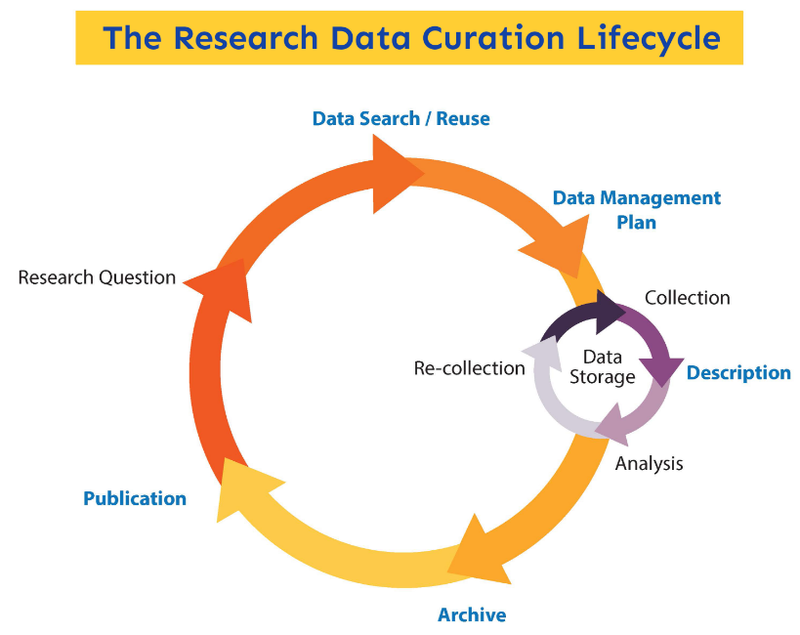 As well as reducing duplication of effort in research data creation, curation enhances the long-term value of existing data by making it available for further high quality research” (What is Digital Curation? , DCC). In other words, Digital Curation is stewardship that provides for the reproducibility and re-use of authentic digital (research) data and other digital assets, while ensuring their long term accessibility (Digital Curation and Trusted Repositories: Steps Toward Success). Find and understand it when needed. Validate your results if required. Ensure your research is visible and has impact. Get credit when others cite your work. is the selective bibliography that includes over 560 English-language articles, books, and technical reports useful in understanding the curation of digital research data in academic and other research institutions. Over 200 new works have been added to the bibliography since version 5.0.
research data creation, acquisition, metadata, repositories, provenance, management, policies, support services, funding agency requirements, peer review, publication, citation, sharing, reuse, and preservation. Most sources have been published from January 2009 through May 2016; however, a limited number of earlier key sources are also included. The bibliography provides links to freely available versions of included works. If such versions are unavailable, links to the publishers' descriptions are provided. Abstracts are included in this bibliography if a work is under a Creative Commons Attribution License (BY and national/international variations), a Creative Commons public domain dedication (CC0), or a Creative Commons Public Domain Mark and this is clearly indicated in the work.